“UFC on Versus 6: Cruz vs. Johnson” took place Saturday night inside the Verizon Center in Washington, D.C.
For the first time in Octagon history, a live championship affair was made available for free viewing. UFC bantamweight champ Dominick Cruz defended his throne against Demetrious Johnson in the night’s main event. 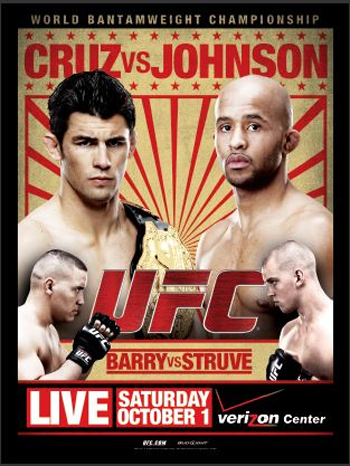 A heavyweight shootout between Pat Barry and Stefan Struve served as the card’s co-featured attraction.